Local shares logged their fifth consecutive day of gains yesterday, thanks to Wall Street's solid showing as trade tensions eased. 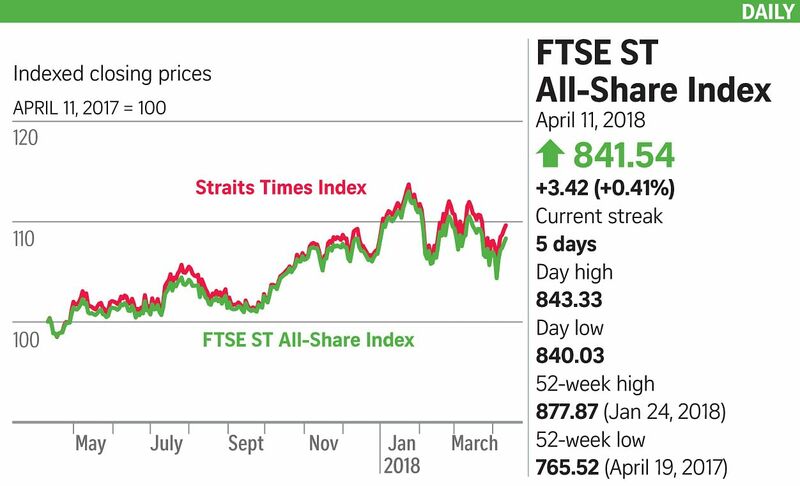 The Straits Times Index advanced 13.38 points, or 0.39 per cent, to 3,479.76. Key regional bourses closed mixed with indices in Japan, South Korea and Australia down, while those in Hong Kong, China and Malaysia ended higher. The gains here came ahead of two key events in the United States - the release of Federal Reserve minutes from its March policy meeting, when rates were raised, and March inflation data. While tensions between the US and China are likely to linger for some time, markets seem eager to grab any relief they can from fears over a global trade war. Much of the optimism yesterday stemmed from Chinese President Xi Jinping's speech on Tuesday that focused on opening up the nation's economy without touching on trade tensions. "President Xi did not deliver any hostile language on trade tensions with the US," said Ms Kelly Chia of Julius Baer's Asian equity research team, but she added that continued "elevated volatility" is expected. The biggest move was in oil as Middle East tensions raised fears over supply and sent prices to their highest level in three years. Oil has benefited from improving sentiment but prices could also reflect fears about an escalation of Middle East tension following the conflict in Syria, said Julius Baer. DBS Group Research said: "Regardless of market jitters, geopolitics, trade tensions, staff turnover of the US government personnel, scandals, scramble on tariffs, anticipated rate hikes, it is too early to suggest we are approaching a recession or the end of the bull markets." Turnover came in here at 1.6 billion shares worth $1.2 billion, with gainers trumping losers 249 to 189. Banking and Jardine stocks led the gains. OCBC was up 0.9 per cent, while DBS rose 0.3 per cent and UOB added 0.2 per cent. IHH Healthcare rose three cents to $2.05. Reports said South-east Asia's largest hospital operator was preparing to submit a bid for India's Fortis Healthcare to compete with a sweetened offer by TPG-backed Manipal Health Enterprises. Spackman Entertainment Group inched up 0.3 cent, or nearly 4 per cent, to 8.7 cents. The firm has inked a deal with South Korean cryptocurrency developer Project Talent to launch utility tokens. Singapore Press Holdings closed unchanged at $2.49. On Tuesday it reported a near 25 per cent year-on-year fall in net profit to $40.19 million on a 1.8 per cent drop in operating revenue to $233.7 million.